It doesn’t get much more Canadian than a bunch of kids and a game of shinny at the outdoor rink. But when one of the “kids” is an up-and-coming NHL hockey star, it vaults the game to the category of Canadian dream. 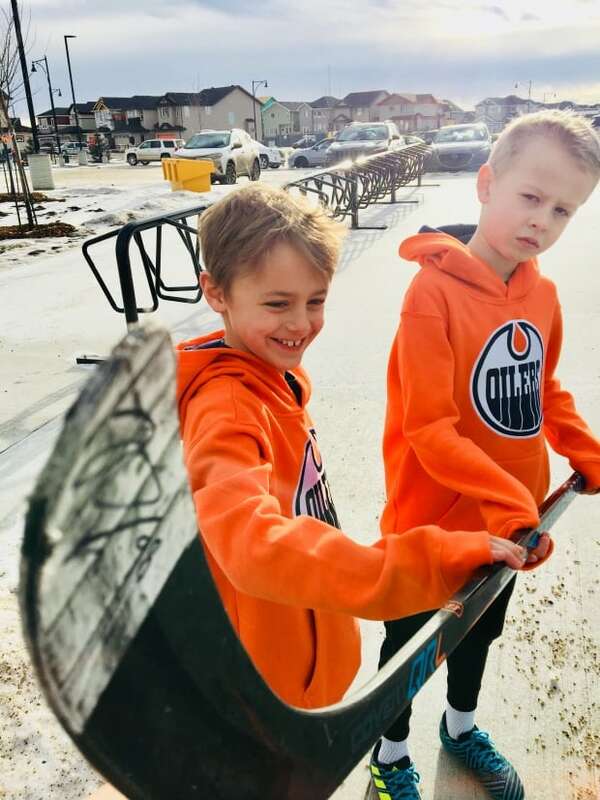 That dream became a reality Tuesday afternoon for Edmonton nine-year-olds Eric Ripka and Logan Green, who pretty much had the Crestwood community rink all to themselves except for a guy on skates and his buddy who was on the ice in his runners. Right away, the two boys — savvy Oiler fans who play together as forwards on the Whitemud West Atom AA — suspected that the tall, lanky player who clearly knew his way around the rink was none other than Oilers rookie Jesse Puljujarvi. Even after noticing the name on his stick and telltale details on his gloves, the boys were shy. “I told Eric to go ask, but he didn’t really want to do that. And I didn’t really want to go up and ask him,” said Logan. “Then he started, like, passing with us and shooting — and I just asked him if he was Puljujarvi,” Logan added. Eric figured that was the case all along. You can say that again. Puljujarvi spent 45 minutes playing two-on-one with the boys — just the three of them on the ice, a couple of nine-year-olds taking on a 19-year-old budding NHL star. “We played a game of shinny, ” said Eric, who was blown away Puljujarvi’s by speed on skates. “He beat us 7-4, but he said ‘last goal wins’ and we scored that, so we kind of won,” he added with a chuckle. Eric’s mom Colleen Ripka says the media attention has been keeping the magical afternoon alive for the boys. “Every time they go to an activity, they see new friends who have seen them on TV or who have heard from friends … so it gets them excited and recreates the moment for them over and over again. It’s huge,” she said. Even sweeter, the boys can relive the afternoon whenever they like, thanks to the camera strapped to Logan’s helmet camera that captured all of the dangles and chatter. As first year Atom A’ players, Logan and Eric are pretty good players in their own right — but what they witnessed with Puljujarvi was, you could say, some next level stuff. The Finnish kid with the big smile certainly didn’t hold back. Realizing this wasn’t going to last forever, Logan raced off the ice to get his mom, who was having coffee in the warming shack, to come take a picture. “My reaction was, ‘You mean the guy who likes pizza? '” laughed Katherine Green. With huge smiles, the boys posed with Puljujarvi for a few pictures, and he autographed their sticks. The whole experience has been quite amazing. Sharing 45 minutes with Puljujarvi on the ice is something neither family will forget. “His parents should be so proud of him,” said Katherine Green, referring to Puljujarvi’s generosity. “He was dangling and deking all around them, but he taught them so much about being a role model, about being gracious, and appreciating what you have,” she said. Logan — who, like Puljujarvi, is a right-handed shot — piped up first, so he got it, said Eric. But the boys have struck a deal: if this ever happens again, Eric gets the stick.